Jamgön Kongtrül Lodrö Thayé is one of the most prominent Buddhist masters in 19th century’s Tibet. Along with Jamyang Khyentsé Wangpo, Chogyur Detchen Lingpa, Mipham Rinpoché and other masters, he contributed to a wide spiritual revival in Eastern Tibet, the Rime or non-sectarian movement. Renowned as an accomplished master, scholar and writer, he authored more than 100 volumes of scriptures. The most famous are his Five Treasuries, which contains 63 volumes of the Rinchen Terdzö, with key texts from the terma literature of the one hundred great tertöns. He revitalized links between all the spiritual traditions of Tibet, thus contributing to their sustainability and showing the fundamental unity of all their teachings. Jamgön Kongtrül was born on the 2nd of December 1813 in a Bön family in Rong-gyab, close to Pema Lhatsé in Drida Zalmogang, Khams, Eastern Tibet. He thus received his first spiritual education following this tradition. In his youth, Jamgön Kongtrül showed all the extraordinary signs and qualities of a contemplative and was particularly devoted to Guru Rinpoché. Difficult material circumstances led him to enter the Nyingma monastery of Sechen where he took full ordination in 1832. 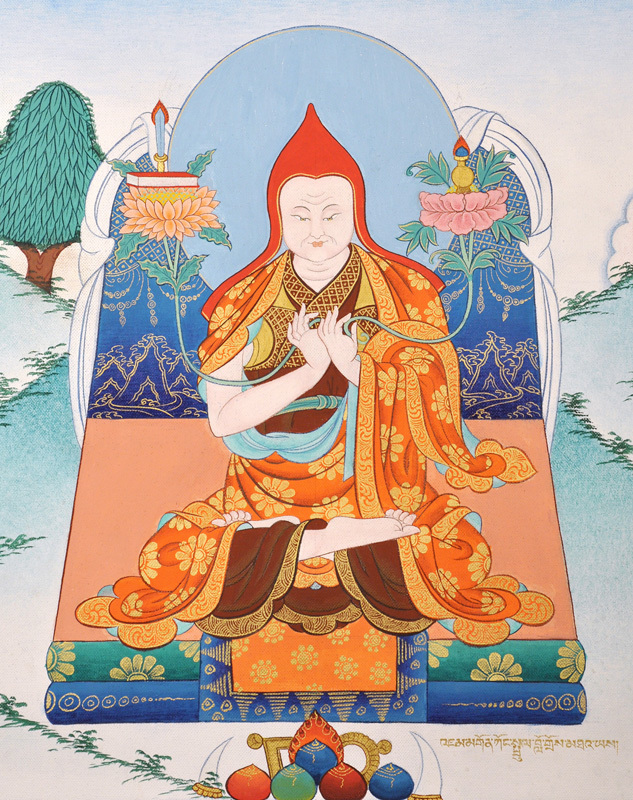 The Nyingma master Jamgön Gyurmé Thutob Namgyal introduced him to the nature of the mind (sems nyid). Afterwards he served as secretary in the Karma Kagyü monastery of Palpung, and was asked to resume the full ordination in this tradition. Noticing such a sectarian attitude between the different schools certainly led Jamgön Kongtrül to define his non-sectarian approach. He wrote down in 1843 a list of his various masters, more than sixty of them represent all the Tibetan schools and lineages. He brilliantly continued his studies and practices with the 9th Situ Padma Nyingjé in Pelpung, and received from the 14th Karmapa Tegchog Dorjé the bodhisattva vows as well as the name Jangchub Sempa Lodrö Thayé, “Boddhisattva of infinite intelligence”. At this very same time he met Jamyang Khyentsé who gave him teachings. Shortly after, in 1842, Jamgön Kongtrül began the traditional three-year retreat in a small hermitage, near Pelpung, at Tsadra Rinchen Drag. This place became his main residence where meditants and retreatants grouped around him. He received many transmissions from Jamyang Khyensté Wangpo. And they became each other’s master in a profound relationship. In 1855 the Nyingmapa tertön Chogyur Detchen Lingpa recognized him as a tertön too. In these difficult times where spirituality was obscured by politics and dogmatic conflicts between Tibetan schools, those masters struggled to go beyond divisions, to reinitiate dialogue between schools and to re-stress the fundamental meaning beyond labels. This was not to mix-up confusingly the different traditions in a single one, but rather to respect and to learn from other traditions while following one’s own. The Rime approach was to preserve transmission lineages, some of them being on the brink of extinction, to codify and compile their teachings and practices, as well as to revitalize them. The diversity of Tibetan traditions was viewed as a tremendous asset of methods, adapted to the diversity of beings and receptivities, aiming towards a single purpose, enlightenment. Kongtrül wrote that Khyentsé, by praying intensely Guru Rinpoché, could meet past masters and tertön and receive their transmissions in visions or dreams. 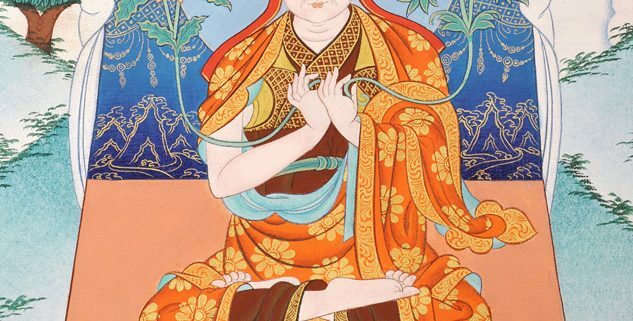 With the compiling and encyclopedic nature of his writings, Jamgön Kongtrül shows his originality by using the Madhyamaka Shentong as unifying model of his eclecticism. He played a fundamental role in preserving many lineages; he was strongly eager to revivify one in particular: the Shangpa Lineage. His whole life reflects an authentic approach of the Dharma beyond confusion or subjectivity, syncretism or sectarianism. He truly embodied the “unity in diversity” paradigm of the Buddha Dharma. His work proved to be one of the most fertile sources of inspiration in the Tibetan tradition as it is practiced worldwide, particularly in the three-year retreat model he set up in Tsadra Rinchen Drag. He left his body on the 28th of December 1899 showing numerous auspicious signs. In the next generation, he had several emanations, the most well-known being: Pelpung Kongtrül, Palden Khyentsé Öser (1904-1953), Sheshen Kongtrül Pema Drimé (1901-1960) and Khyabjé Kalu Rinpoché (1904-1989). In the third generation, Pelpung Kongtrül Tcheuky Sengé Tenpé Gotcha (1954-1992) was particularly reknown; he was a student of the 16th Karmapa and taught in Occident.